Have you dreamt of getting married in a castle, creating that extra special fairy-tale wedding you’ve always wanted? You’ll find the venue that will make your dream wedding a reality situated just outside Hartebeespoort Dam, next to the R513. 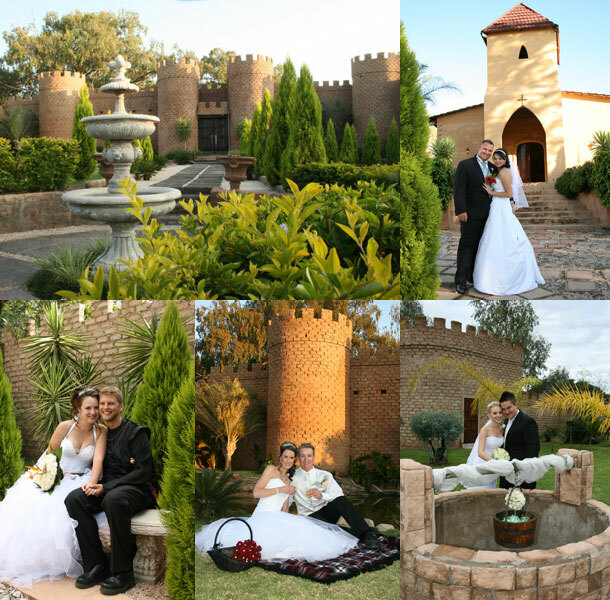 Camelotte Wedding Venue in Brits can accommodate up to 200 guests in our air-conditioned Chapel and Reception hall. A red carpet leads you into our chapel, with its wooden benches and up to the candle-cross where the ceremony takes place. The lead-glass windows paint the interior in an array of colors to complete the feeling of romance. Surrounded by water, the castle is entered over a wooden drawbridge. The round table has come through ancient times as part of the Camelotte legend. And the food … well … as in ancient traditions, we promise you a feast! To book your wedding at this fairy-tale venue visit Camelotte. Hello, ek trou 31 Augustus 2013,het julle nog hierdie datum oop? En watse troupakette bied julle aan teen watse pryse. Ek sal dit wardeer as julle vir my ‘n kwotasie kan stuur,ons praat van so 130 gaste en 17 kinders.